This is a historic shop that was founded in 1875 and is still running generations after generations. It is one of the oldest departmental stores of the city and is still known for top quality goods. 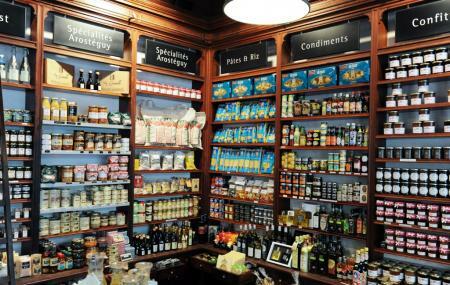 They mainly deal in food products such as spices, olive oil, canned meat and fishes, wines and preserved local beverages. They also have their online setup at present. How popular is Maison Arestoguy? People normally club together Playa De Marbella and Plage Du Port Vieux while planning their visit to Maison Arestoguy. Great selection of teas and other curiosities from the region. Lovely and friendly staff. Would definitely recommend. This shop has an amazing selection of teas with a friendly staff eager to help. Although prices may seem a bit high, the tea is so unusual that I think it is worth the price. They also have wine, cheese, and local condiments that make great gifts. I visited Maison Arosteguy several times during my week in Biarritz! J'ai acheté en ligne, petit problème avec un bocal ouvert dans le carton lors de la livraison, j'ai reçu un nouveau colis avec un mot d'excuse très rapidement. Merci et bravo pour ce super service client! Небольшой но очень хороший магазин вин, где можно после работы по дороге домой купить бутылку вина и закуски для того, чтобы вечером в домашней обстановке ужинать.